While some companies are making headway with AI, the truth is the majority of organizations are still in the beginning phases with AI. The Web giants are definitely using AI – and developing and open sourcing many of the tools to build AI – but they’re also investing billions of dollars to do it. And all of the AI use cases up to this point are what’s called “narrow AI,” not the “general AI” HAL 9000 that doomed Discovery One. Suffice it to say, you’re not too late to the AI party. If you’re a mid-sized company in an established real world business that actually makes, moves, or manages tangible assets (i.e. you’re not a digital native moving bytes for profit), there is still time to harness AI to give your company an advantage. If you’re a digital native, you probably have already implemented AI (and you wouldn’t be reading this newsletter, anyway). But if you’re an IBM i shop, your AI journey should probably start with IBM. Big Blue is making a huge effort to bolster its line of AI solutions. That includes developing AI-specific versions of the Power Systems server designed to crush machine learning jobs hungry for CPUs and GPUs. Big iron, either on-prem or in the cloud, is a requisite for many machine learning workloads. But much of the innovation is going on in AI revolves around software, which conjures IBM’s sprawling Watson brand. Watson once referred to the Power-based supercomputer that beat Ken Jennings at Jeopardy! back in 2011. But today Watson is the umbrella term for all of IBM’s AI offerings, which includes over 100 different products and services (that is, APIs). The core IDE in the Watson lineup is called Watson Studio, which was formerly known as Data Science Experience. This product offers a notebook-style interface for data scientists to write machine learning code in a variety of languages, including R and Python. Watson is IBM’s brand for all of its AI software products. IBM’s product for deploying machine learning into production is called Watson Machine Learning. IBM offers two versions, including WML Community Edition, a free product that comes loaded with the latest deep learning software like TensorFlow and Caffe, as well as IBM’s own SnapML, which is a souped-up version of the popular Scikit Learn product. IBM also sells a more advanced version called WML Accelerator (WMLA), which was formerly called PowerAI. This offering is designed to handle really big machine learning models that need to scale across a cluster of machines. While most Watson offerings will now run on X86 in addition to Power (which IBM announced at its recent IBM Think 2019 conference), WMLA remains a Power-only affair, due to the fast NVLink connections that IBM built into the Power9 chip and its Power AC922 system to link those Power CPUs with Nvidia Tesla GPU accelerators. 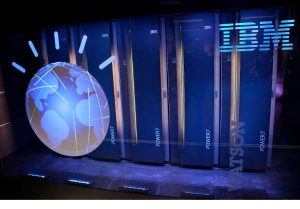 IBM has committed to keeping Watson as open as possible. Much of the software that underpins Watson, including the fast in-memory Apache Spark processing framework, is open source, and it’s IBM’s plan to leverage the open source community to keep Watson relevant as technology inevitably improves. IBM has encouraged its IBM i customers to begin using Watson to process data originating in IBM i Montreal, Quebec-based Fresche Solutions recently launched a series of courses to help train IBM i developers how to use the various Watson APIs that are available on the cloud. But IBM i shops aren’t limited to running in the cloud. In fact, many of these other solutions can run on Power, too. H2O.ai and Anaconda both support Power with their machine learning automation tools. In fact, one IBM i shop from South America, Vision Banco, recently discussed its use of H2O.ai with IT Jungle. According to Vision Banco’s head data scientist, Ruben Diaz, the Paraguay bank started out using SPSS statistical tools to calculate key variables in the business equation, including credit scores, fraud risk, and odds of defaulting on a loan. The company developed the statistical equations in SPSS, and then implemented them as stored procedures in the DB2 database powering its core IBM i banking applications, Diaz said. The company expanded its statistical work several years back and adopted other tools like KNIME and R. The company started using more advanced models, such as random forests and gradient boosting machines (GBMs), and exported them using predictive model markup language (PMML). It would then call the routines from the core IBM i banking system via a REST-based Web service, Diaz explains. About three years ago, the company embarked upon the third generation of its data science setup, which included H2O’s popular suite of machine learning algorithms. Diaz and his colleagues began using more advanced algorithms, including XGBoost, neural networks, and advanced collections of algorithms called ensembles. Recently, the company moved up to DriverlessAI, a new suite of predictive tools from H2O designed to automate much more of the data science process. The company also bought an IBM AC922 server equipped with the latest Tesla V100 GPU accelerators from Nvidia. In the future, Diaz hopes to develop more data science use cases as Vision Banco, including system that utilize time-series datasets to detect money laundering, and audio and video processing using NLP and the latest deep learning techniques. Vision Banco is one of the biggest banks in Paraguay, with about 1,800 employees and 800,000 customers. In the United States, it would be considered a solid medium-sized business. With a team of just seven data scientists and analysts – not to mention the gunship of an AI server, the Power AC922 – Diaz is able to utilize data to make better predictions about his business, with a roadmap to implementing some of the most advanced neural networking techniques. Clearly, we’re at the beginning of a new era in computing, one driven by statistical probabilities. If a solidly midsize IBM i shop like Vision Banco can implement this stuff, what’s holding you back? 7 Common Complaints apply to your current HA solution? Stuck with a bad investment?